The signature pastry you will find at Olde World Pastries Plus is our Danish Kringle. We use five secret ingredients in the dough that comes from recipes that are hundreds of years old and brought to America by Danish immigrants. Making our kringles requires a lot of patience because the labor of love takes a set amount of time for the mix and more time to sheet the dough before it’s filled and baked. 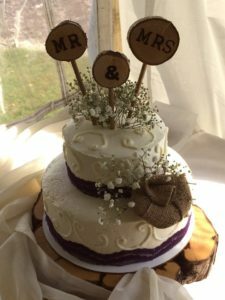 We call our specialty wedding cakes and cupcakes “boozed up” cakes because you will find they have a blended in touch of alcohol. Sure, we can make regular wedding cakes, cupcakes, Danish layer cakes, mini-cheesecakes, and other traditional cakes. Wedding boozed up cupcakes include the Adam & Eve (lemon with brandy and a forbidden fruit liqueur buttercream), Afterglow (pineapple ginger with an everglow vodka-tequila lime buttercream), Happily Ever After (peach and cranberry with whiskey rhubarb buttercream), Walk Me Down the Aisle (orange infused with blue curacao with a rum-tequila buttercream), Sweet Temptation (dark chocolate infused with chocolate liqueur with a Grand Marnier and Galliano buttercream), The Wedding Bell (cherry infused with gin with an orange and vermouth buttercream), The White Lily (white infused with rum and anise syrup with an orange buttercream), and Yes (coconut and rum infused with orange liqueur passion fruit and cherry buttercream). 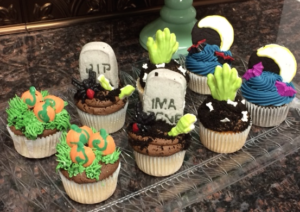 Check out these cute Halloween Cupcakes! New for this Halloween Season, they will be the hit of any Ghoul or Goblin. Available by custom order. Please inquire about regular wedding cakes, and check back for our cake list which is coming soon. Olde World Pastries Plus boozed up cupcakes come in a variety of interesting flavors, ranging from Mango Rum (guess the ingredients), The Blarney (chocolate chip with Irish cream and Bailey’s), Rum and Coke (enough said), Strawberry Margarita (lime and strawberry with a tequila glaze), Frangelico Chocolate Hazelnut (espresso, Frangelico and hazelnut with cream cheese), The Cosmopolitan (raspberry with a cream cheese, lime, and vodka frosting), Drunken Butter Rum (vanilla, pecan, and lots of rum), The White Russian (vanilla with a vanilla and vodka glaze with a whipped cream and Kahlua frosting), The Irish Car Bomb (Guinness and chocolate with a whiskey ganache and Bailey’s buttercream), The Mojito (vanilla and rum with a lime and rum syrup with a lime and mint cream cheese frosting), Blackberry Cabernet (chocolate and cabernet sauvignon cupcake with a blackberry and cabernet buttercream), Banana Foster (banana drizzled with rum and a cream cheese frosting drizzled with caramel), The B-52 (vanilla drizzled with a Kahlua syrup and a Bailey’s buttercream), and Harvey Wallbanger (orange cupcake drizzled with vodka syrup with an orange, Galliano, and vodka buttercream). Please inquire about our regular cupcake options. We import our Yooper-style pasties from Michigan’s Upper Peninsula. Dobber’s Pasties in Escanaba is our source for rutabaga pasties that are offered in beef, chicken, and vegetable with cheese varieties. We have tried quite a few pasties in our day, and have found that Dobber’s Pasties are the most authentic and tastiest around. If you are looking for stollen, kolache, or other European bakery delicacies, including our cheesecake varieties, contact us. We also produce seasonal pastries, such as caramel apple, mixed berry, and pumpkin kringle in season. We also do custom cookie trays which give you the option of buying the dough in bulk, already cut-out, baked but unfrosted, or completely finished.